Day 298: Caught Up In The Crossfire . . . So much happening in the world – and it hasn’t stopped just because we decided to run away from home for a few days . . . the President in Africa, the Supreme Court made some huge rulings today, the Russians (or is it the Cubans?? – where is this guy) are courting their new found friend from the NSA, the Super Moon has come and just about gone, the Black Hawks won the Stanley Cup — sorry Bruins — and Paula Deen is still looking for work . . . WOW! Having taken some time off, both for pleasure and for business, we’ve discovered that being away from home helps us appreciate being home. Now, this never ever diminishes the value, love and importance of spending time with our kids. We have to admit, we’re crazy about our girls and would love to have the both around as much today as we did when they were growing up. It’s one of those things about growing up that gets us caught in the crossfire of life. We love them and want them around, but we know that they’ve got to carve their own niche. One of the best ways to avoid getting caught in the crossfire is to take some time and relax while doing some stuff you normally wouldn’t – – – like visiting the Sam Adams Brewery (which Brian and the girls did today while Jean was at her conference) or taking in a game at Fenway Park and catching sight of the Green Monster (which Jean and the girls, along with Clark Kent, did this evening while Brian was in route home to Texas). Both were awesome times and adventures to check off the bucket list! 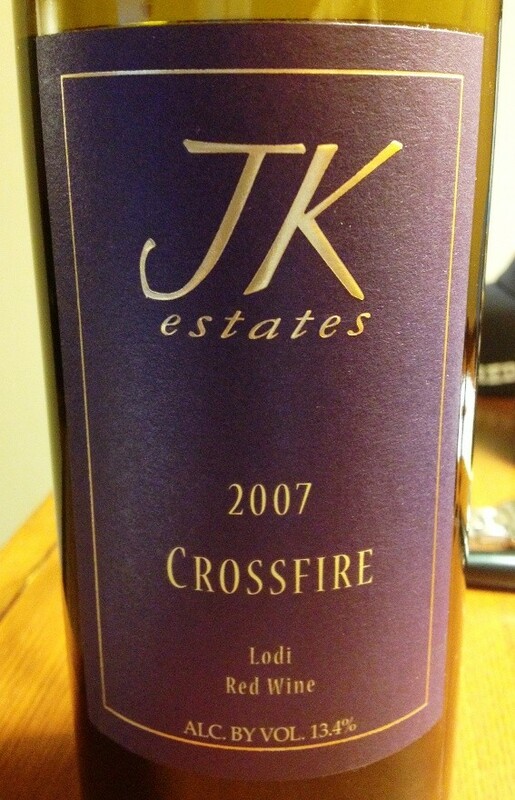 Tonight, we opened a 2007 Crossfire from JK Estates out of Lodi, California. Lodi is one of those places that we want to visit. Lots of great Zinfandels and Cabernets from Lodi and it’s in a great part of the state. Tonight’s wine is a wonderful blend of Cabernet Sauvignon, Merlot and Syrah. This wine greeted us with strawberry pie, boysenberry, blackberry, black licorice and pomegranate juice aromas and flavors. Its’ soft tannins and spice, the Syrah’s plum flavor along with black pepper and black cherry make this wine a royal treat with a lingering clean finish. It is an excellent wine for sipping or to serve at an elegant dinner as the perfect compliment to beef, lamb, pork with rich fruit sauces and hearty pastas. At less than $13 a bottle, this highly rated wine is recommended as a best buy, and given its’ 2007 vintage, if you can get a hold of some, we’d suggest you get it and FAST! Spending time away with family makes it an even better deal and this week we’ve been able to get a real taste of the Boston area – it is truly a great place and we look forward to returning and spending more time. As the week unfolds, we hope you’ll avoid the crossfire by continuing to enjoy your favorite wine responsibly and remembering to recycle whenever possible. Categories: Uncategorized | Tags: Crossfire, Crossfire Blend Wine, Fenway Park, JK Estates, Paula Deen, Sam Adams Brewery, Super Moon, The Red Sox | Permalink.